Next in our series on creative new uses for old-house items and materials, I’m tackling my personal favorite among the piles of discards in the architectural salvage yard: windows. When I saw this in Apartment Therapy I just couldn’t wait to tell y’all about it. Monica Ewing at Craftynest–a crafter, Web designer, and former designer for O and Real Simple–turned an old window into a great little piece of wall art. She attached some wallpaper samples from FabMo, a San Francisco organization that collects discontinued designer materials and puts them in the hands of creative craftfolk. Kudos, Monica. What a smart way to add interest to a room. I had an idea when I was window shopping (har har) online the other day. Multi-paneled mirrors like this piece from Pottery Barn sure look an awful lot like windows anyway, right? For a poor man’s version, why not use the real deal? Take an old window frame that’s crying out for a little face time, and attach small pieces of mirror (or mirrored acrylic) inside the panes. Hang it on your wall, and voilà. You’ve saved little piece of old-house history, and added openness and light to your contemporary digs. You dig? 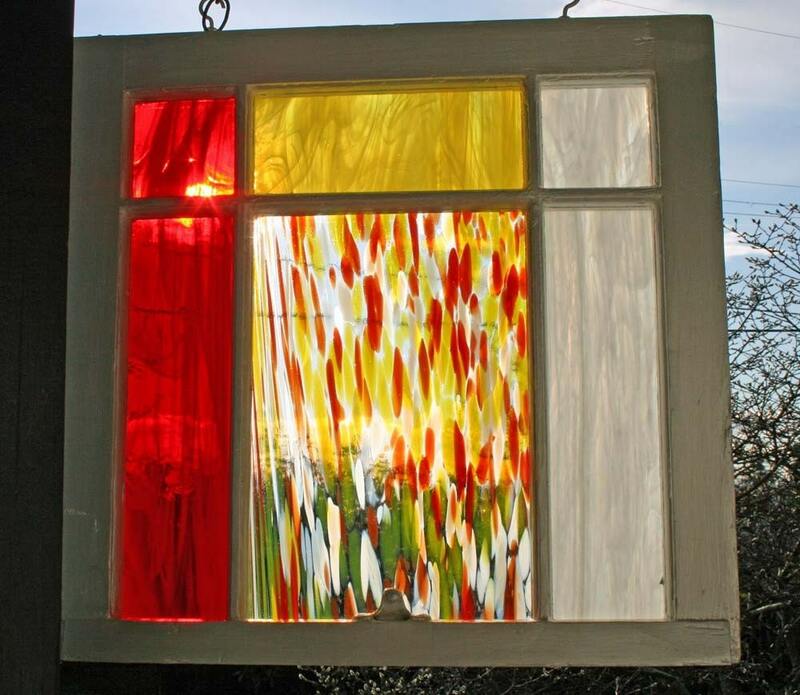 Etsy vendor SemperNova, who rescues and reinvents furniture and home decor items destined for the landfill, had a beauty of an idea: Turn a humble old window frame into a stained-glass showcase. Stellar stuff, SemperNova. Michigan crafter Catherine Spencer found a window on the side of the road and turned it into a jewelry holder. She screwed a piece of scrap wood across the bottom to create a little shelf for rings, pins, and odd pieces that can’t be hung up. She used cup hooks to store necklaces and bracelets tangle-free and in plain sight. A piece of plastic mesh stapled inside of one window pane holds her dangly earrings. Nicely done, Catherine. Yet another fine offering from Gail at My Repurposed Life: a display case. The woman is a storehouse of upcycling ideers. Here’s another brainstorm I had. What’s the difference between this old window…. … and this drying rack (as seen in Country Living)? I’ll tell you what’s the difference: You. With a little bit of your love and attention, an old window (and a piece of beadboard) can have a whole new lease on life in your laundry room. What would you add to this list, dear readers? If you’ve got a repurposing project that has you twitterpated, get to tweeting, and use the #ReuseIt tag, which was recently introduced by OHW’s Lucy O’Neill. Let’s keep the conversation going!